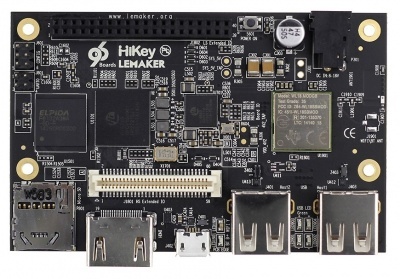 The HiKey(LeMaker version) board is the first board to be certified 96Boards Consumer Edition compatible. This board is base on the Kirin 620 eight-core ARM Cortex-A53 64-bit SoC running at 1.2GHz and delivering over 10,000 Dhrystone VAX MIPS total performance. The SoC also delivers high performance 3D graphics supported with its ARM Mali 450-MP4 GPU. 1GB/2GB 800MHz LPDDR3 DRAM, 8GB eMMC Flash Storage and the standard 96Boards microSD v3.0 socket provide high performance running any supported operating systems. Flexible storage options and connectivity are available through 802.11b/g/n WiFi, Bluetooth 4.0 LE, two high speed USB 2.0 ports (1 OTG), an HDMI 1.4 1080p video output with audio, DSI display and CSI camera interfaces. The HiKey board is the standard 96Boards credit-card form factor powered by an 8-18V DC 2A power supply. You can download Hikey schematic from here.